First of all, he was over a year before he even started cutting his first tooth! He got his bottom middle two teeth first, and one has come in completely crooked. We assumed that he'd get his middle top two next, but boy were we wrong. The snaggle tooth showed up on the scene and has been stealing the show ever since! The one on the other side started coming through and we were anticipating him looking like he lost his two front teeth, but now it looks like the middle two are going to give it a run for it's money. 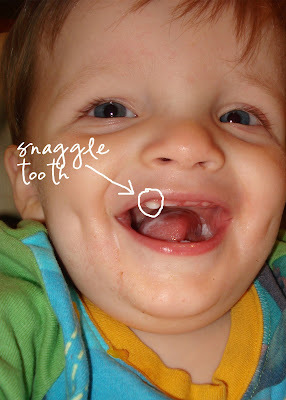 :) We're hoping that Luke is going to have all of his wierd tooth issues with his baby teeth and that his permanent teeth will come in perfectly straight beautifully spaced. A girl can dream, right??? In the meantime, Luke's lack of teeth is not slowing him down when it comes to eating and trying new foods. This week he's been introduced to pork chops, pimento cheese sandwiches (ewww! this was Dave's doing, not mine! ), crescent rolls, twice baked potatoes and caramel caribou ice cream. He's loved it all (surprise, surprise) and somehow manages to chew like a champ!